No more dead parrot-fashion learning. No more rote learning by passive pupils. Let us enter the age of Project Based Learning – and see why the American College of Sofia officially has been given the title of an “Innovative School”. The American College of Sofia follows project based learning, an effective, dynamic and enjoyable way for pupils to acquire and retain the knowledge they need. It’s an approach based on the idea that students acquire a deeper knowledge through active exploration of real-world challenges and problems. Let’s translate that into English, or shall we say, science. Today we are visiting three classes at the American College of Sofia’s science department, the grade 11 and 12 chemistry and physics profiles. 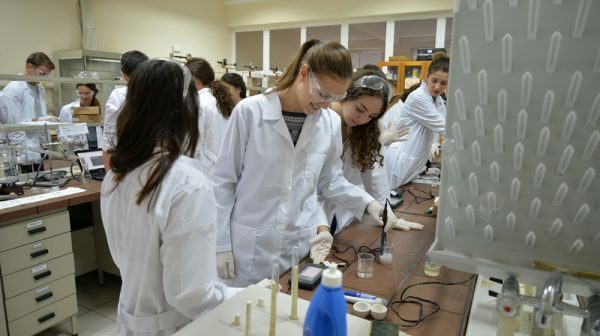 In the well-equipped physics lab, science department head Krasimira Chakarova and her colleague Vanya Angelova are interacting with pupils who are working in separate teams to go through a stage of experiments they are conducting. The pupils were given their tasks the previous week, and before beginning the practical stage, had to come up with three theoretical sources on which to base their experiments. Here, a laser is being used in an experiment involving condensation; there, a meniscus optika and at another table, a team is seeking to establish why it is that clothes go dark when they’re wet. That’s the thing about project based learning, PBL to initiates. Pupils are learning to use the scientific method to answer a research question, and in the process, also improve their communication skills by writing a scientific article, giving an oral presentation and engaging in debate to defend their findings. In the case of these science experiments, they have learnt to use the devices, carry out observations, and must keep a journal to record all of these observations, which will be submitted to the teacher for discussion and feedback. This process, of which today’s session is part, began around the start of the second week of November and will continue to third week of January, with a final research paper submitted and then the engagement, in the presentation, with opponents and reviewers. This would be a good place, by the way, to mention that they rather seem to be enjoying themselves. That seems to be the case too in the chemistry lab, where teachers Nevena Kalpakova and Diana Vladimirova are overseeing proceedings. Dressed in lab coats and safety equipment at hand – though the possibility of youthful larking around in this rather disciplined environment does not appear to exist – the pupils are grouped around sundry experiments. Dropping by to speak to the pupils leaves the impression of them speaking with considerable authority about what it is they are trying to establish. Divided into groups of three, each group has been assigned a sensor and given a task using it. After submitting their research proposal to their teacher and after doing the prescribed corrections, students had to set up their experiment from scratch – depending on what they have chosen to do. 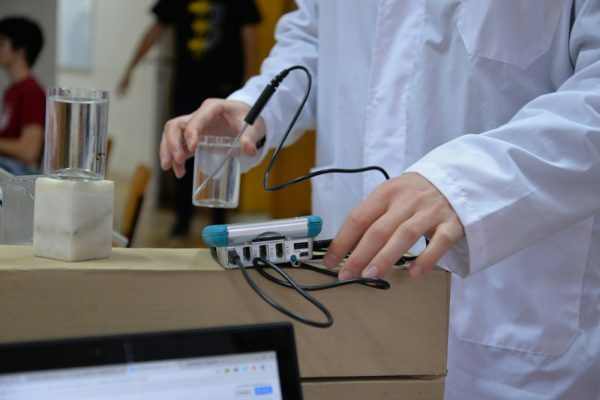 Each group of students then performed their individual experiments and recorded their measurements which were then transferred on their Google Chromebooks, an item with which each pupil at the American College of Sofia is equipped. The final step of each of their projects is then to prepare a Google Slides presentation and report their findings (purpose of the experiment, hypothesis, methodology of work, materials that are needed, areas of improvement of their experiment, conclusions and real-life importance of the experiment) to their classmates. Three of the experiments involve measuring PH – in common household products such as different brands of bleach; in popular drinks such as cola and fruit juices; and in common pharmaceuticals. 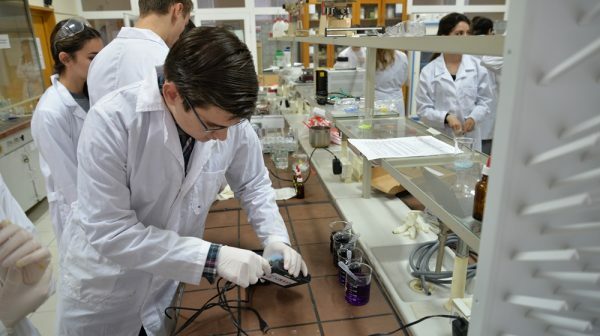 A fourth involved measuring electro conductivity in different brands of mineral water, spring water, distilled water, water from a mineral spring in Dobrinishte and even a water sample a student had brought from Brussels. On to Chemistry IB 11, with teacher Cindy Lee. She explains, before the class starts, what that “IB” means. It stands for International Baccalaureate, a system to which the American College of Sofia is accredited and which is geared to enabling pupils to be able to transfer to any other similarly top-standard learning institution, on the basis of internationally-recognised qualifications. In short, an international student, should continuing education in another country become necessary for reasons of a family move, can transition to another good school without the trauma that this can risk. The pupils troop in and take their seats, politely introducing themselves. They’re all international students, and tuition is in English. On each desk in the classroom, there’s a Google Chromebook. In front of the class, there’s an electronic screen. We begin with roll call, with each pupil marking themselves present digitally. This is followed by a review of the work learnt in the previous lesson. One has to like the level of engagement that the technology makes possible. This is no longer a matter of one or another pupil being called on, leaving anyone out from the review of the work. You know, the kind of pupil who fades to the back of the room and hopes not to be called on. Every pupil answers every question, and their answers appear on the screen. There’s more to it than that, though. This is the age of teenagers and online games, and the giving of the answers goes on the board in the form of Kahoot, a free game-based learning platform. Google Classroom is in use, and it is striking how much faster and efficiently learning can proceed. And the results of all this? Of this year’s graduating class at the American College of Sofia, about half are in the science profile. As Krassi Chakarova explains to the visitor, many – as has happened before – will go on to top-quality universities in the UK and in continental Europe, and some who are able to win bursaries or other support will cross the ocean to get their degrees in the US. In 2017, the Bulgarian Ministry of Education and Science officially gave the title of “Innovative School” to the American College of Sofia for its project integrating technology into the learning environment through the use of Chromebooks and the Google Classroom platform. The project was made possible by a generous donation of Chromebooks from the American people via the American Schools and Hospitals Abroad (ASHA) programme of the US Agency for International Development (USAID). 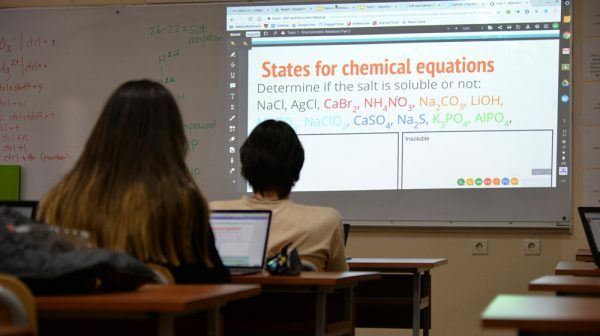 The first Chromebooks were introduced in 2015 in Eighth Grade at ACS, and at the start of the 2017 school year this past September, the American College of Sofia has 800 Chromebooks to help every student study in Google’s virtual classroom. So, the science equipment in use in the chemistry and physics labs also was donated by ASHA. The Ministry of Education’s committee on innovative schools featured psychologists, sociologists, pedagogy experts, representatives of the science community, professionals with a track record in innovation in the realms of education, science and technology. The innovation processes described in the green-lit projects will have a duration of four years. For each school year, there are specific levels of progress and results to be monitored by the ministry, and the goals and ideas are outlined pertaining to the personal, intellectual and emotional development of the students. To learn more about admissions to the American College of Sofia, please click here.